Summer in Santorini is in full swing – the island is buzzing with life. Everyone is flocking to the beaches and what you need is a tall refreshing drink! A favourite here in Greece is Greek Frappé – A.K.A. 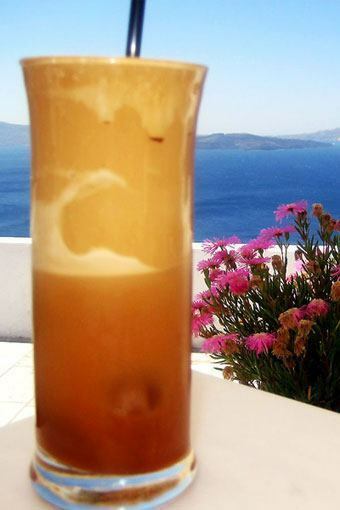 Greek Iced Coffee. Made very simply from any instant coffee, as much or as little sugar as you want (a medium sweetness is 1 to 1 1/2 teaspoons of sugar), evaporated milk and ice cold water, frappé is simple and fast to make. Some people add ice cubes but we think that waters the beverage down. And of course you need a frappé whizzer – something that makes milkshakes. There are a few variations on making a frappé, some put the water first, others put ice – some don’t. We find the best way is this: Get a tall glass and a teaspoon. Place 1 to 2 teaspoons of instant coffee and the same for sugar (how much depends on how you like your coffee). Pour a shot of room temperature water onto the mixture. Then whiz it up to a nice thick creamy texture. Get ice cold water and fill up the glass almost to the top. Add some evaporated milk. And there you have it – your own homemade Greek Frappé! Greek frappé was invented in 1957 at the International Trade Fair in Thessaloniki. The representative of the Nestlé company, Yannis Dritsas, was exhibiting a new product for children, a chocolate beverage produced instantly by mixing it with milk and shaking it in a shaker. Dritsas’ employee Dimitris Vakondios was looking for a way to have his usual instant coffee during his break but he could not find any hot water, so he mixed the coffee with cold water and ice cubes in a shaker. And thus the Greek Frappé was born! 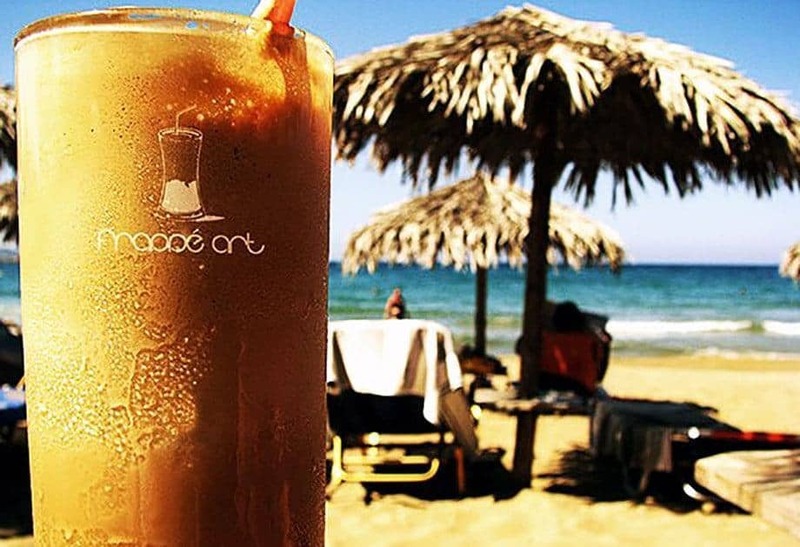 Frappé is served everywhere in Greece – indeed some people fondly call it the Greek National Drink. Making the perfect frappé is considered an art – so you might find that you like it in some cafes and not in others. Everything is in play – the amount and thickness of the foam, how cold it is, the establishment’s interpretation on what is “sweet’, “medium” or “extra sweet”. You can also order it without sugar or milk – or black with sugar – or milk no sugar. Each man’s Frappé is a very personal matter.